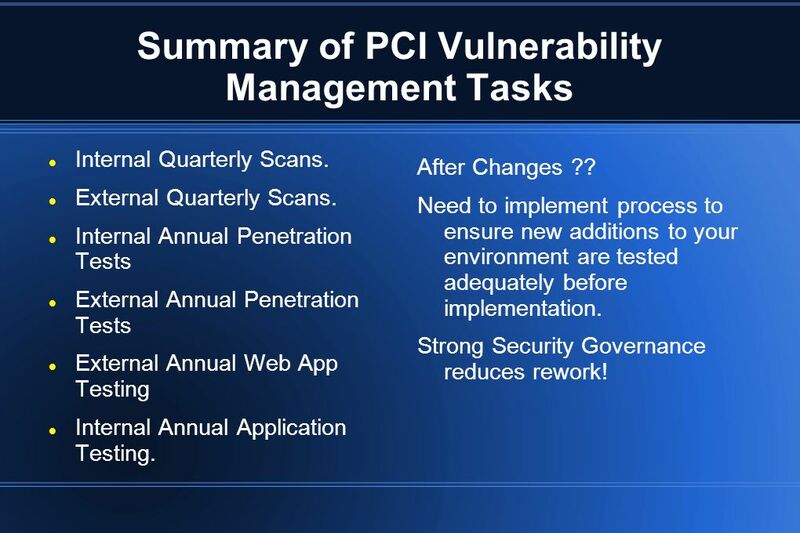 Approaches to meeting the PCI Vulnerability Management and Penetration Testing Requirements Clay Keller. 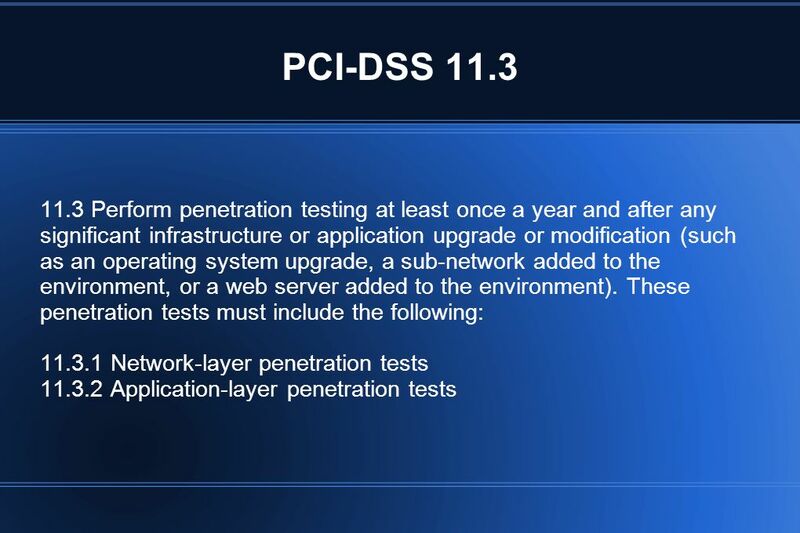 2 Full PCI Glossary at following url. 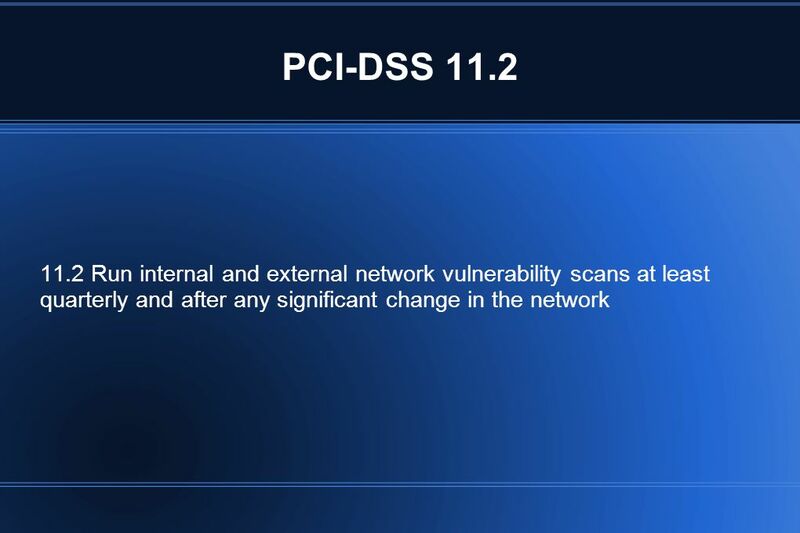 PCI : Acronym for “Payment Card Industry.” DSS : Data Security Standards. There are 12 groups of standards. 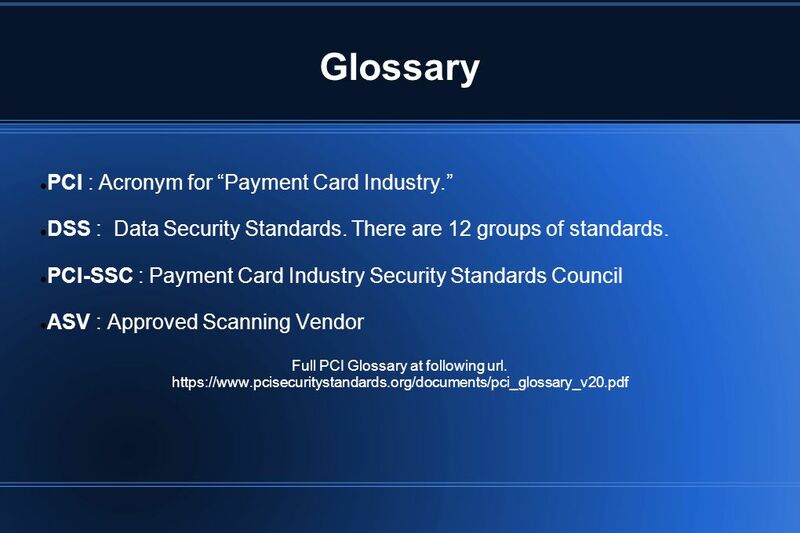 PCI-SSC : Payment Card Industry Security Standards Council ASV : Approved Scanning Vendor Full PCI Glossary at following url. 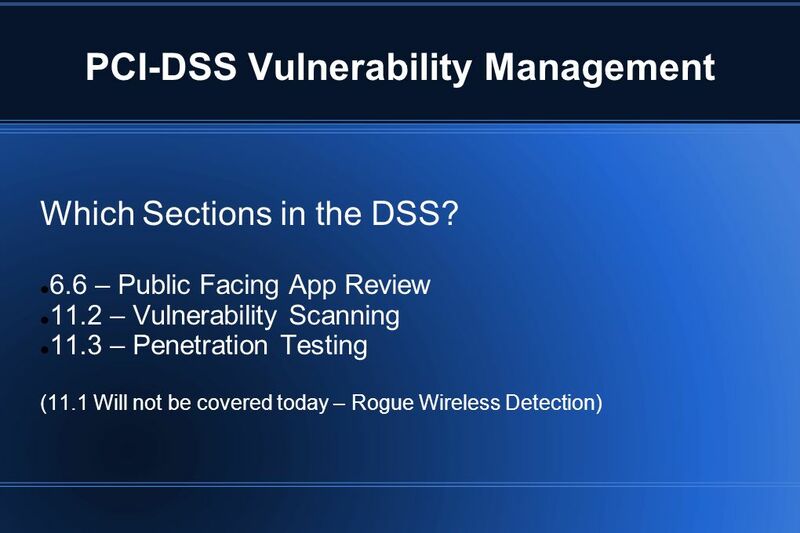 Vulnerability Scanning Penetration Testing How to meet those requirements. 4 Disclaimer! 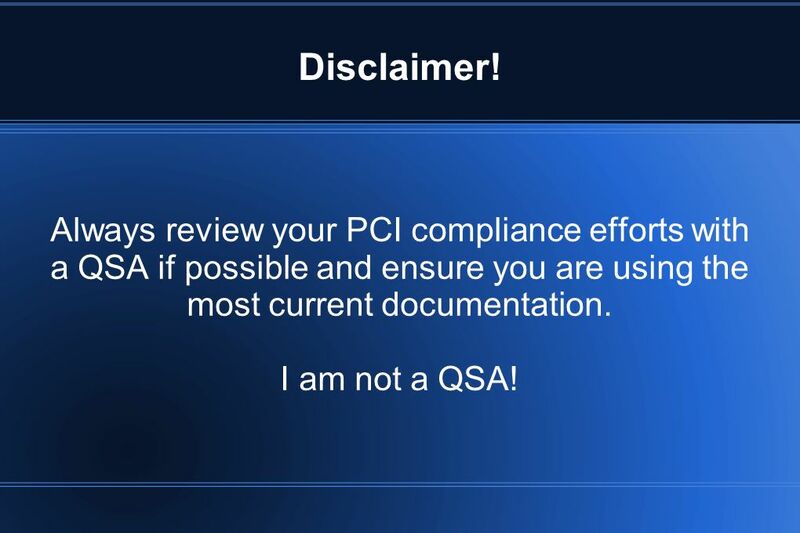 Always review your PCI compliance efforts with a QSA if possible and ensure you are using the most current documentation. I am not a QSA! Contract with a 3rd Party Provider to perform testing. 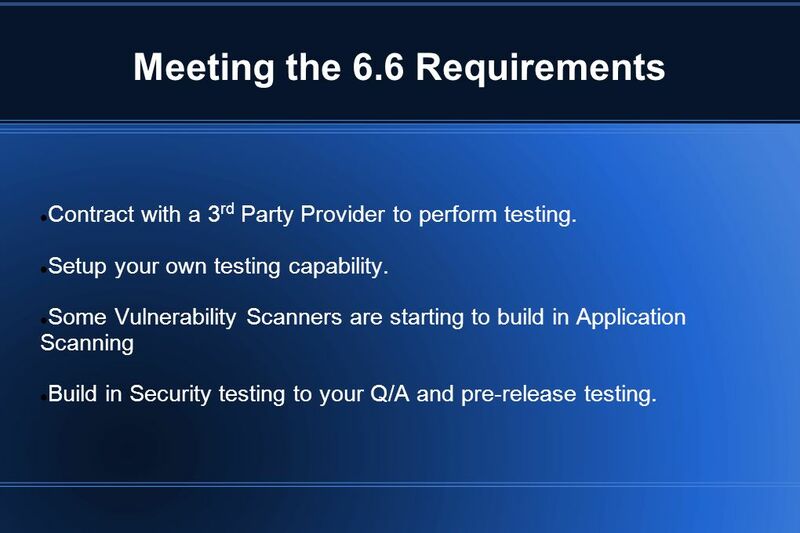 Setup your own testing capability. Some Vulnerability Scanners are starting to build in Application Scanning Build in Security testing to your Q/A and pre-release testing. Implement a Web Application Firewall (WAF) A web application firewall (WAF) is an appliance, server plugin, or filter that applies a set of rules to an HTTP conversation. Generally, these rules cover common attacks such as Cross-site Scripting (XSS) and SQL Injection. 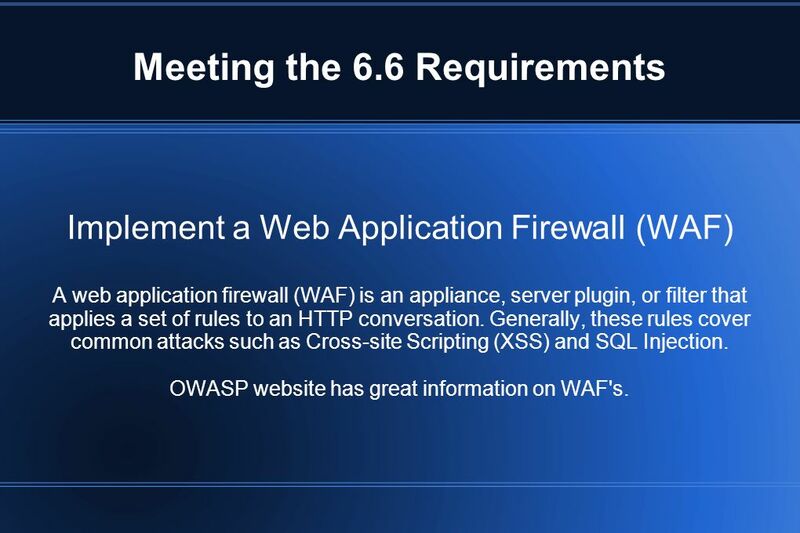 OWASP website has great information on WAF's. 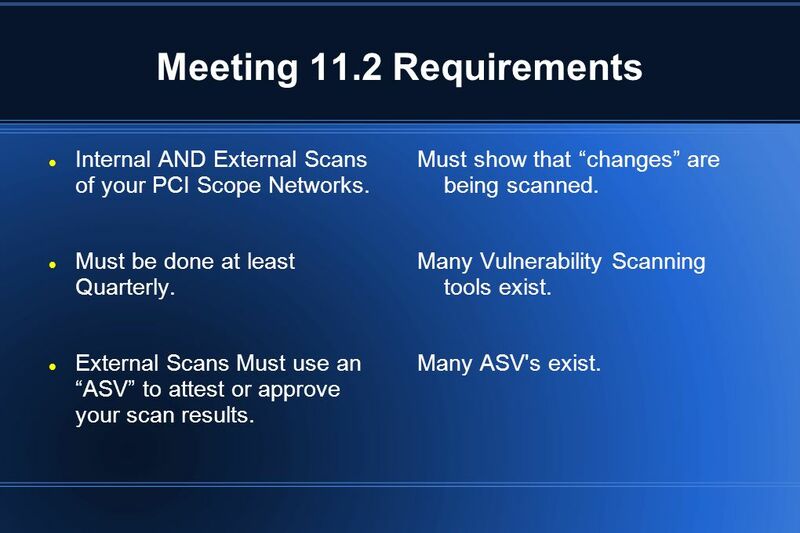 11 Meeting 11.2 Requirements Internal AND External Scans of your PCI Scope Networks. Must be done at least Quarterly. External Scans Must use an “ASV” to attest or approve your scan results. Must show that “changes” are being scanned. Many Vulnerability Scanning tools exist. Many ASV's exist. 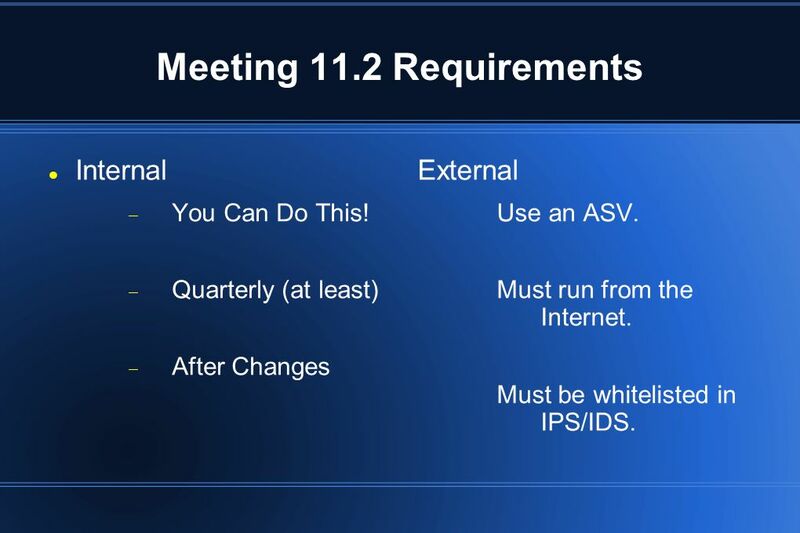 12 Meeting 11.2 Requirements Internal External You Can Do This! Quarterly (at least) After Changes External Use an ASV. Must run from the Internet. Must be whitelisted in IPS/IDS. 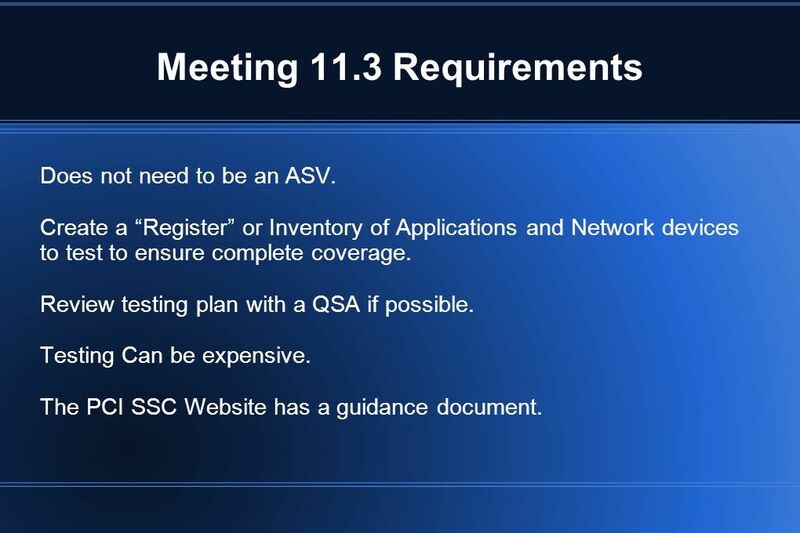 15 Meeting 11.3 Requirements Does not need to be an ASV. 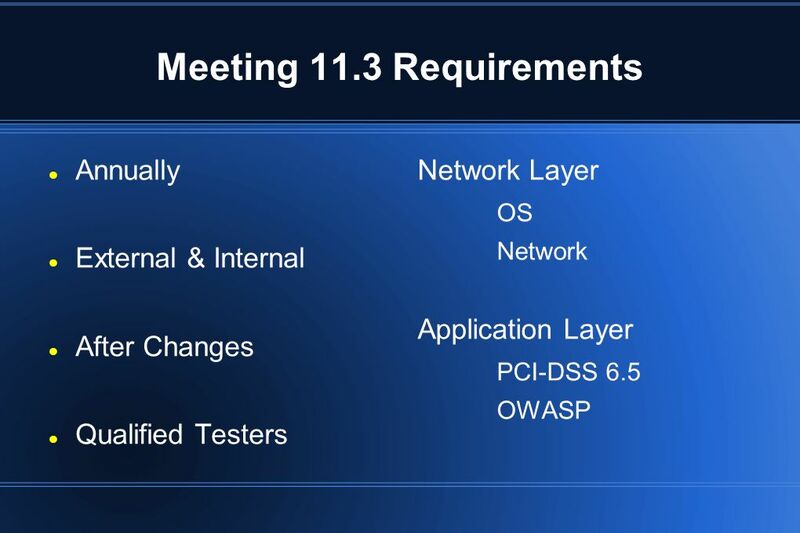 Create a “Register” or Inventory of Applications and Network devices to test to ensure complete coverage. Review testing plan with a QSA if possible. Testing Can be expensive. 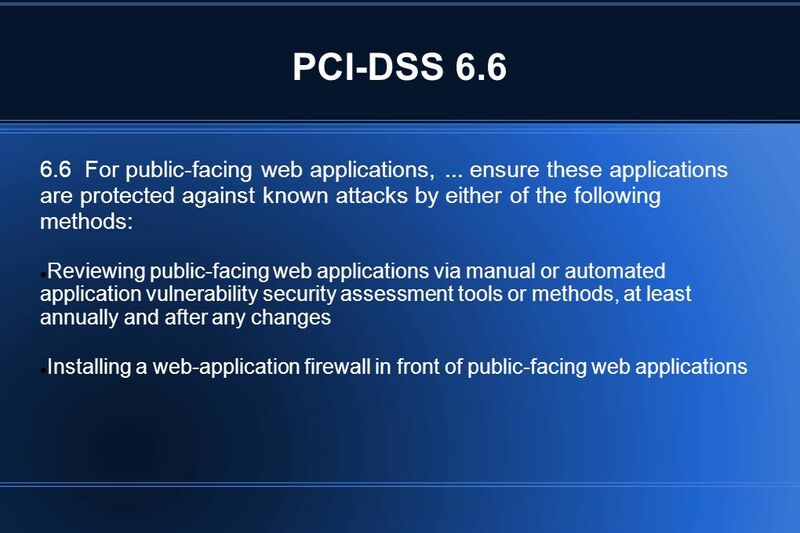 The PCI SSC Website has a guidance document. Internal Quarterly Scans. External Quarterly Scans. Internal Annual Penetration Tests External Annual Penetration Tests External Annual Web App Testing Internal Annual Application Testing. After Changes ?? 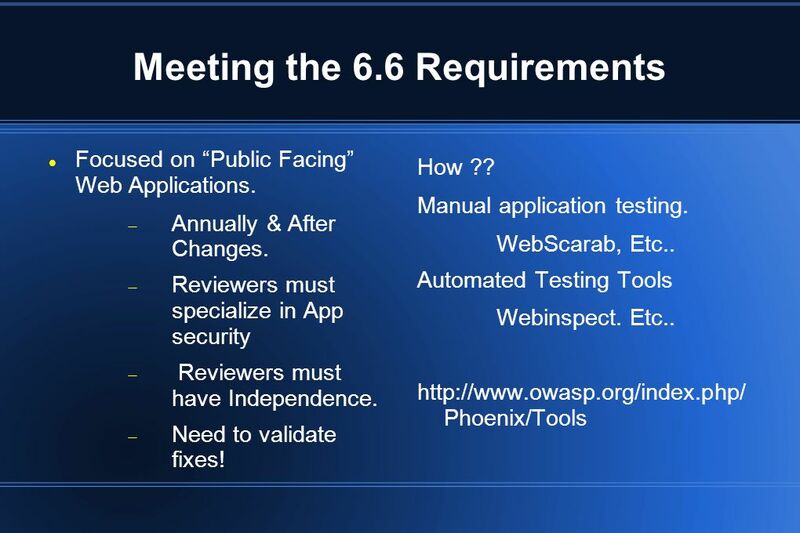 Need to implement process to ensure new additions to your environment are tested adequately before implementation. Strong Security Governance reduces rework! 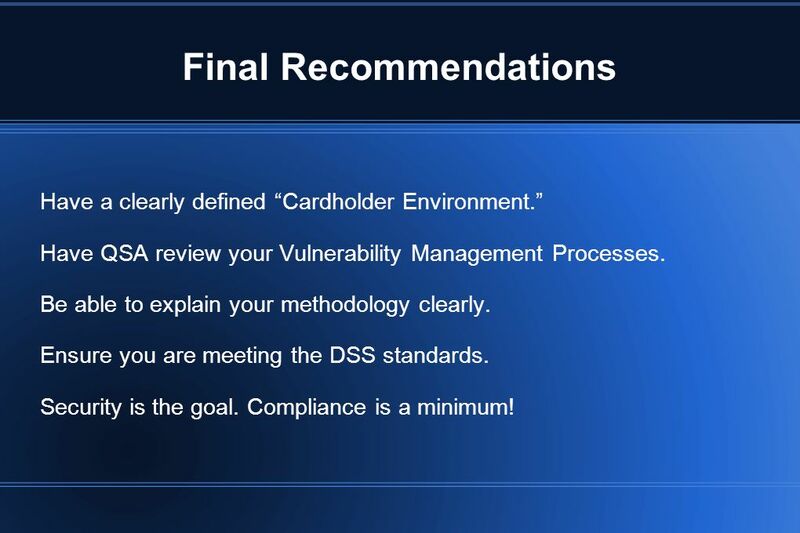 Have a clearly defined “Cardholder Environment.” Have QSA review your Vulnerability Management Processes. Be able to explain your methodology clearly. Ensure you are meeting the DSS standards. Security is the goal. Compliance is a minimum! 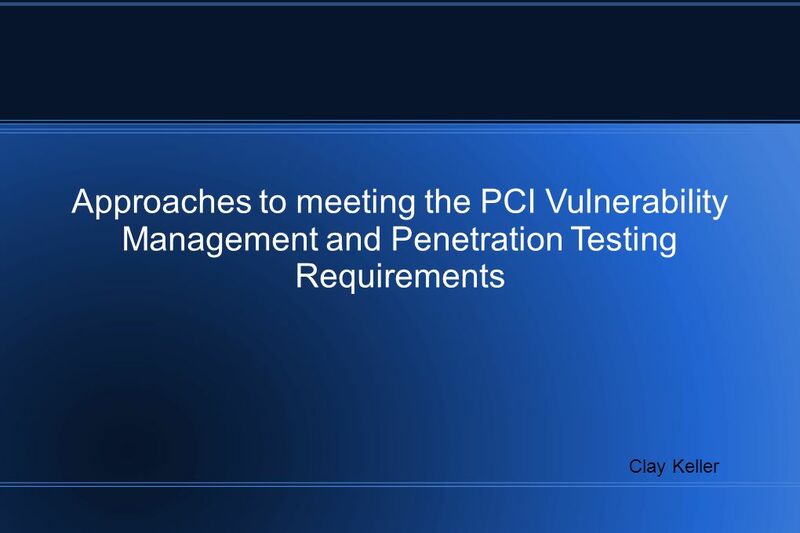 Download ppt "Approaches to meeting the PCI Vulnerability Management and Penetration Testing Requirements Clay Keller." Innovating Since 1998 Direct EDJE, we make A World of Difference Direct Response Order Management Software A Proven Solution Since. Surviving the PCI Self -Assessment James Placer, CISSP West Michigan Cisco Users Group Leadership Board. Evolving Challenges of PCI Compliance Charlie Wood, PCI QSA, CRISC, CISA Principal, The Bonadio Group January 10, 2014. Payment Card Industry Data Security Standard Tom Davis and Chad Marcum Indiana University. Retail Security and Compliance – Where On Earth is it Headed? An overview of the retail sectors IT threats and how to be more effective in preventing them. Troy Leach April 2012 The PCI Security Standards Council. 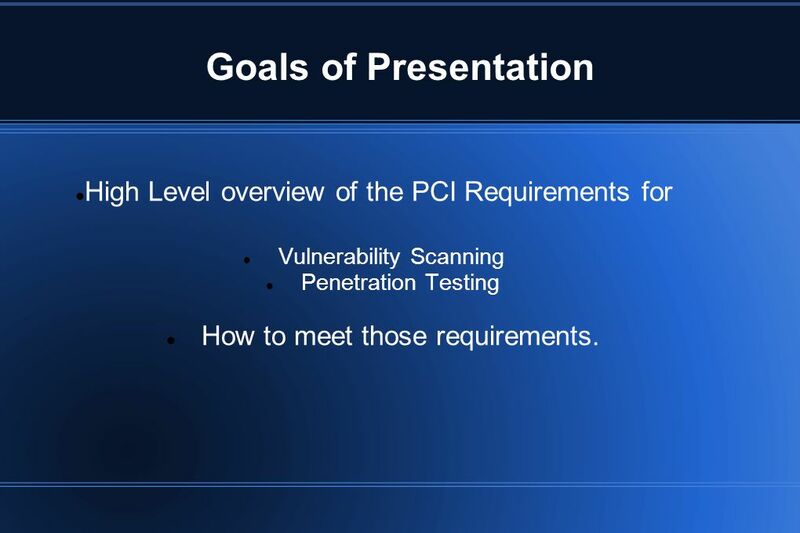 MARTAs Road to PCI Compliance 1 Presenter: Yolanda Curtis, PMP AFC Project Manager. PCI:DSS What is it, and what does it mean to you? Dale Pearson 17 th November 2009. HI-TEC 2011 SQL Injection. Client’s Browser HTTP or HTTPS Web Server Apache or IIS HTML Forms CGI Scripts Database SQL Server or Oracle or MySQL ODBC. State of Software Security 1 Jeff Ennis, CEH Solutions Architect Veracode. Credit Card Security for the SQL DBA Andy Warren. PENETRATION TESTING Presenters:Chakrit Sanbuapoh Sr. Information Security MFEC. Zenith Visa Web Acquiring A quick over view. Web Acquiring Allows merchants to receive payments for goods and services through the Internet Allows customers. 2014 PCI DSS Meeting OSU Business Affairs Process Improvement Team (PIT) Robin Whitlock & Dan Hough 10/28/2014. JEFF WILLIAMS INFORMATION SECURITY OFFICER CALIFORNIA STATE UNIVERSITY, SACRAMENTO Payment Card Industry Data Security Standard (PCI DSS) Compliance.